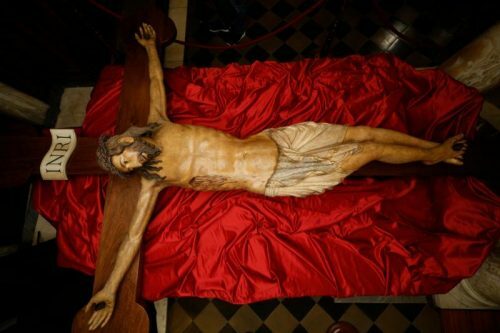 The oldest crucifix in the basilica’s possession, it was made by an unknown sculptor of “exceptional artistic talent” and technical skill sometime in the early 1300s, and hung in the original fourth-century basilica of St. Peter, built by the Emperor Constantine, said Bishop Vittorio Lanzani, secretary of the Fabbrica di San Pietro, the office responsible for physical care and maintenance of St. Peter’s Basilica. When Pope Francis called the Year of Mercy, the basilica accelerated plans to have the crucifix studied and restored, which took 15 months of difficult and delicate work, Cardinal Comastri said. Because moving it too far from where it had been abandoned was too risky, the canon’s sacristy nearby was turned into a makeshift restoration studio. With funding from the Knights of Columbus, restorers used thermal lasers to blast off one layer of paint at a time and “cutting-edge” solvents that dissolve specific substances like oils, lacquers and grime, leaving desired colors unaltered, said one of the lead restorers, Lorenza D’Alessandro. Experts monitored their progress with stereo microscopes — which are often used in microsurgery — to make sure they removed only selected areas and layers. She said they identified nine successive layers of paints, varnishes and protective coatings on the body and 15 layers on the white, gold-bordered loincloth. They filled the gaps, she said, by mixing the sawdust left behind by the termites with a binding material that was then shaped to the body. 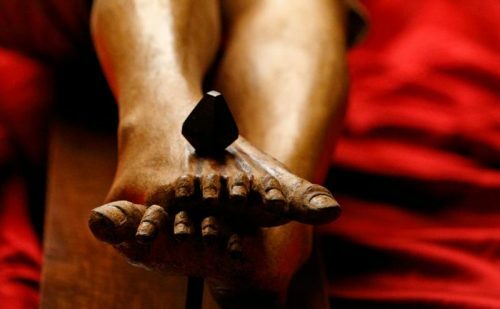 They replaced a thick painted rope that had been wrapped around Christ’s head with a crown of real thorn branches from a species known as Christ’s Thorn found near the Mediterranean. 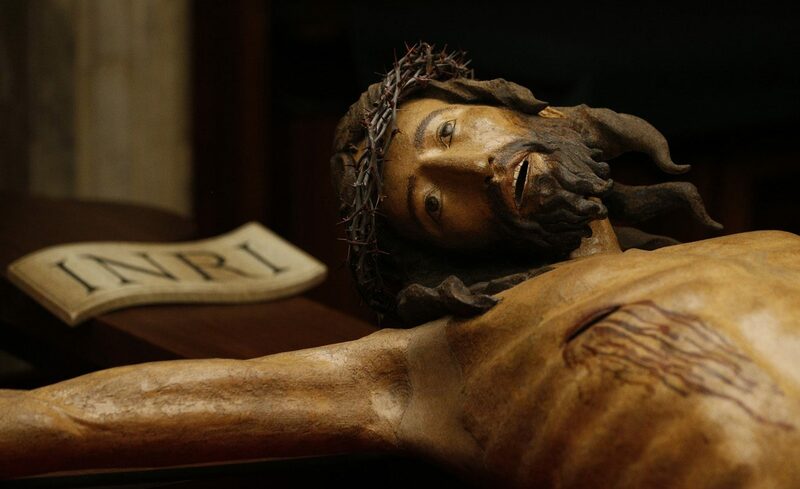 The original cross the Christ had been nailed to was lost long ago, she said, so workers at the Fabbrica crafted a new one from seasoned walnut wood that had grown near an ancient Marian sanctuary in central Italy. 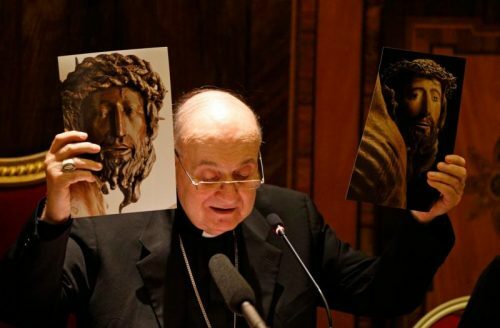 It will be hung on the wall to the left of the entrance, so when people enter, they will immediately be met by Christ’s gaze at the very moment he readies himself to give his life for all of humanity, he said. The Knights provided the funding for its restoration to show “solidarity with the Holy Father” for the Year of Mercy, said Carl A. Anderson, supreme knight of the Knights of Columbus.